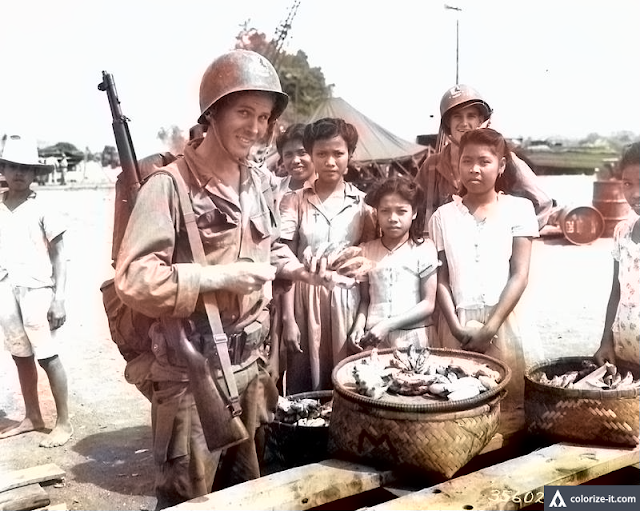 A US Army soldier in Batangas, 1945. Image source: United States National Archives. 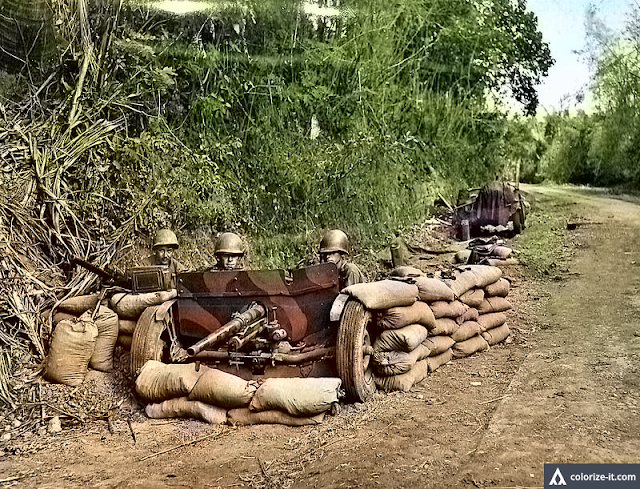 A set of pictures taken by the United States Army Signal Corps in the Philippines in 1945 and filed away at the United States National Archives in digital format are labeled has having been taken in the “town of Santo Tomas, Luzon, P.I.” In the island of Luzon, there are towns named Santo Tomas at least in the provinces of La Union, Isabela, Pampanga and, of course, Batangas. The phrase “at least” is used because these are what show up in the initial pages of a Google Search. A closer examination of the captions, however, confirm that the town called Santo Tomas where the pictures were taken was, indeed, the northernmost town of the Province of Batangas. First, all the pictures were dated 18, 24 or 25 March 1945. Second, two combat groups of the United States Army were involved: the 7th Calvary as well as the 8th Cavalry. Finally, the captions seem to indicate that the pictures were taken at around the time when the town of Santo Tomas was being liberated from Japanese Occupation. We refer now to a United States Army document listing the approximate dates when the towns of the Philippines were liberated from Japanese control. For Santo Tomas, the date given was 28 March 1945. It further stated that the town was “seized” from the Japanese by the 7th Cavalry. These details were contradicted by Robert Ross Smith2 who, in a book, wrote that Santo Tomas was taken four days earlier on the 24th; and that the combat group involved was the 8th Cavalry. A word about the pictures below: a couple of the pictures have graphic content that may not be suitable for younger readers. These are intentionally hidden but may be seen in a drop-down widget at the reader’s discretion. A road block north of Santo Tomas, 1945. Image source: United States National Archives. Original caption: Pfc. Joseph Quesada, Aiden, Arizona, Pfc. Melvin Taylor, New Martinsville, West Virginia and Pfc. Henry Pagget, El Paso Texas, member of the 7th Cavalry Headquarters Troop; man a road block to prevent enemy infiltration on Highway #1, north of Santo Tomas, Luzon, P.I. Taken 25 March 1945. Graphic content below. Discretion is advised. Filipino civilians shot by US Army soldiers for creeping up on their positions. Image source: United States National Archives. Original caption: When Filipino civilians tried to creep up to United States positions, they were detected and shot down by U.S. Cavalrymen. 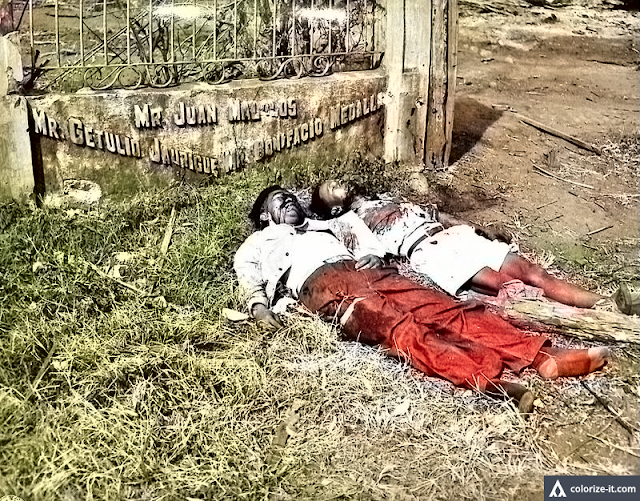 Here they lie in front of a school in Santo Tomas, Luzon, P.I. Taken 25 March 1945. 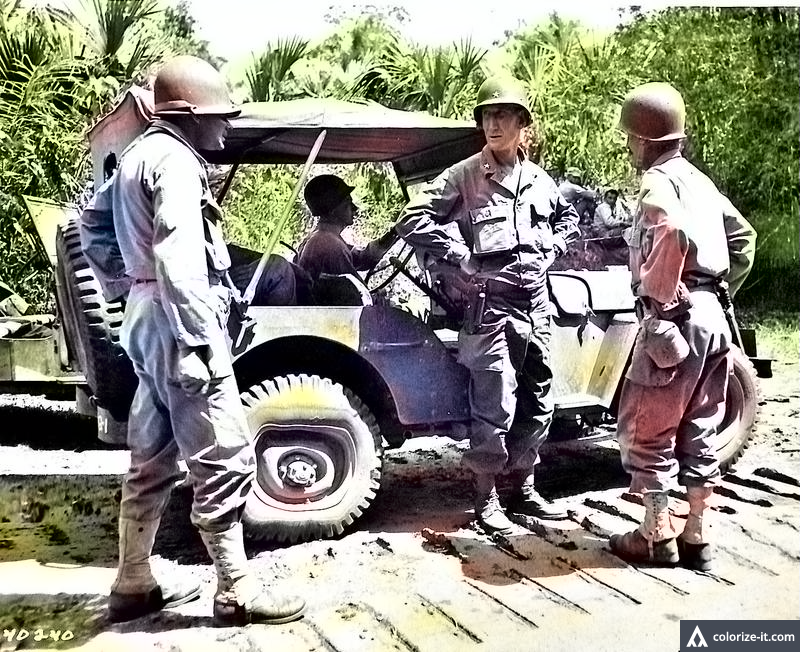 A US Army patrol in Santo Tomas, 1945. Image source: United States National Archives. 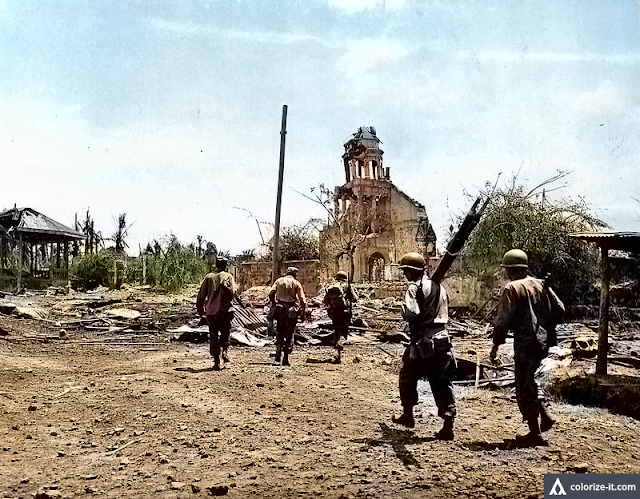 Original caption: A patrol of cavalrymen of the 8th Cavalry Regiment moves into the battered town of Santo Tomas, Luzon, P.I.to dispose of the remaining Japs in the area. Taken 24 March 1945. 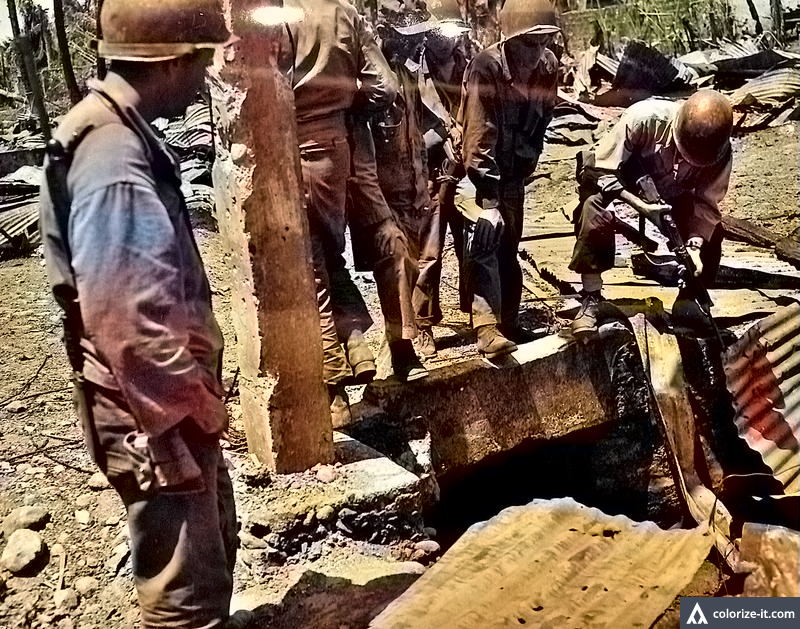 US Army soldiers examine a culvert for the presence of the Japanese. Image source: United States National Archives. Original caption: Cavalrymen of the 8th Cavalry Regiment look into a culvert in the battered main street of Santo Tomas, Luzon, P.I. looking for Japanese. Taken 24 March 1945. At the Liberation Festival, Santo Tomas, 1945. Image source: United States National Archives. 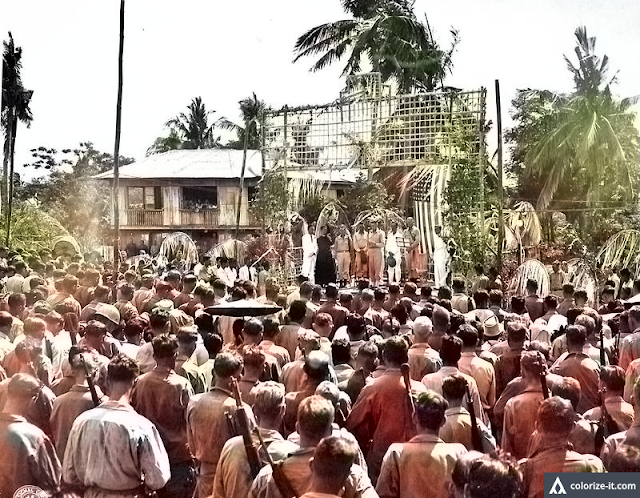 Original caption: Townspeople and members of the 33rd Division listen to an address of welcome by Mayor Euseno Tavora (Tabora?) at the Liberation Festival, Santo Tomas, Luzon, P.I. Taken 18 March 1945. A US Army commanding general at the Liberation Festival, Santo Tomas 1945. Image source: United States National Archives. 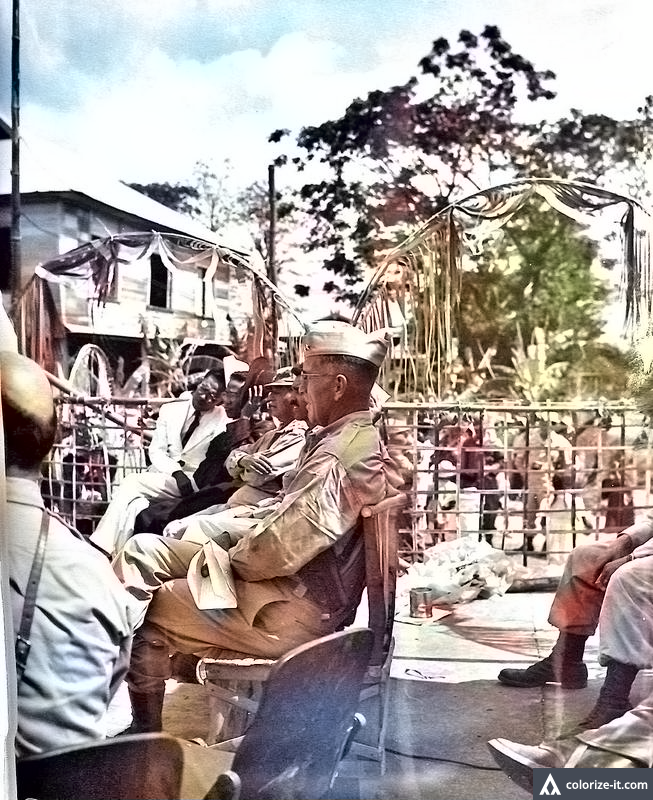 Original caption: Major General P. W. Clarkson, Commanding General, 33rd Division, and area military commander, hears a speech by Mayor Euseno Tavora (Tabora?) while seated on the rostrum at the Liberation Festival, Santo Tomas, Luzon, P.I. Taken 18 March 1945. The chaplain delivers the invocation at the Liberation Festival, Santo Tomas, 1945. Image source: United States National Archives. Original caption: Lt. Colonel William J. Rogers, Chaplain of the 33rd Division, delivers the invocation at the Liberation Festival. Santo Tomas, Luzon P.I. Taken 18 March 1945. 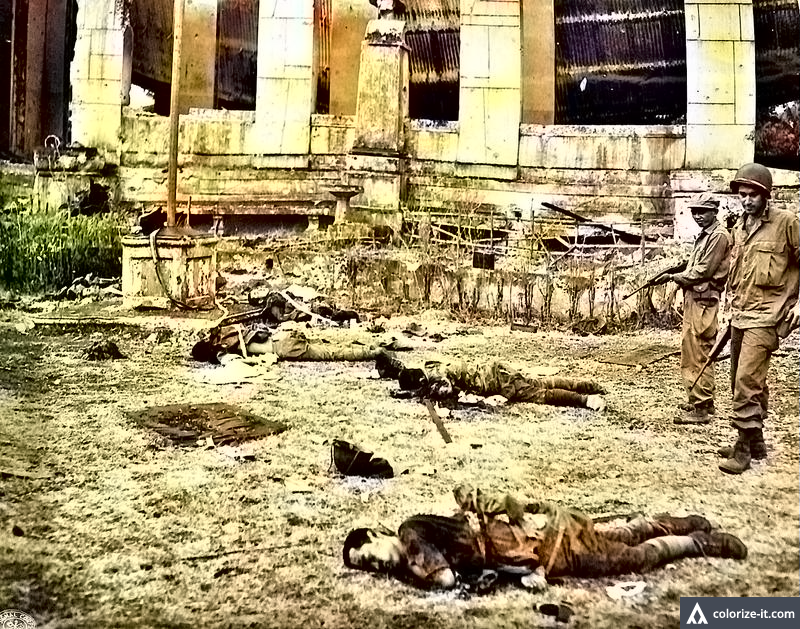 Bodies of dead Japanese in Santo Tomas, 1945. Image source: United States National Archives. Original Caption: Members of the 7th Cavalry Regiment, 1st Cavalry Division, grimly look over the bodies of Jap dead in the town of Santo Tomas, Laguna Province (erroneous, should be Batangas), Luzon, P.I. 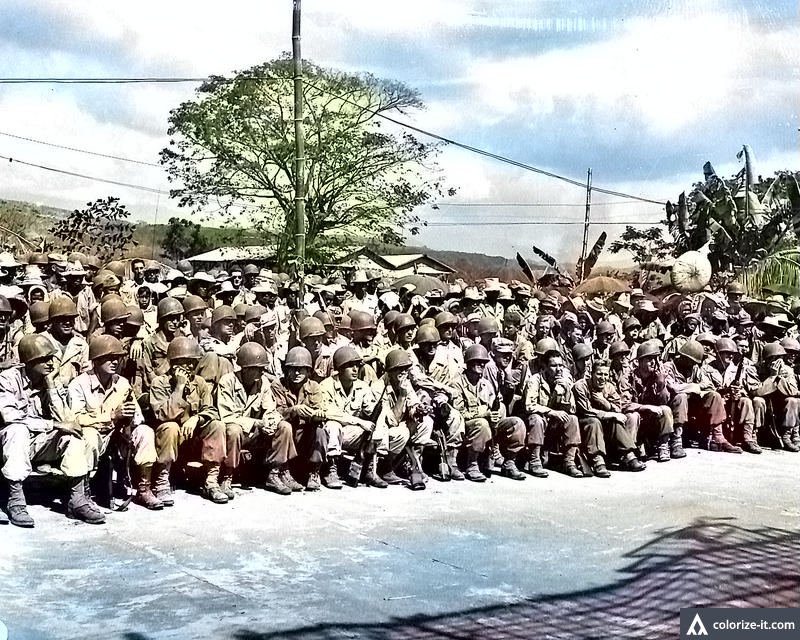 Troops of the 7th and 8th Cavalry and a Filipino guerrilla force captured the town. Taken 25 March 1945. A veteran of the UST Internment Camp arrives in Santo Tomas, 1945. Image source: United States National Archives. Original caption: Brigadier General Hugh F. T. Hoffman, Commanding General, 1st Cavalry Division (center), is greeted by Colonel Charles Brady, Orange, New Jersey, as the former steps out of a jeep. Colonel Brady has assisted in the rescue of internees in (University of) Santo Tomas Internment Camp. U.S. forces are attempting to liberate the town of Santo Tomas, Luzon, P.I. Taken 25 March 1945. 1 “List of Towns Liberated by the US Army from 17 October 1944 to 11 August 1945,” created 1945 by the Office of the AC/S for Intelligence, G2, United States Army Philippines-Ryukyus Command.